Truth be told, I had no intention of making anything close to an actual pie with this recipe. At first I thought it had been a massive failure. I wanted to make more of a thick blondie with a layer of pecan on top. 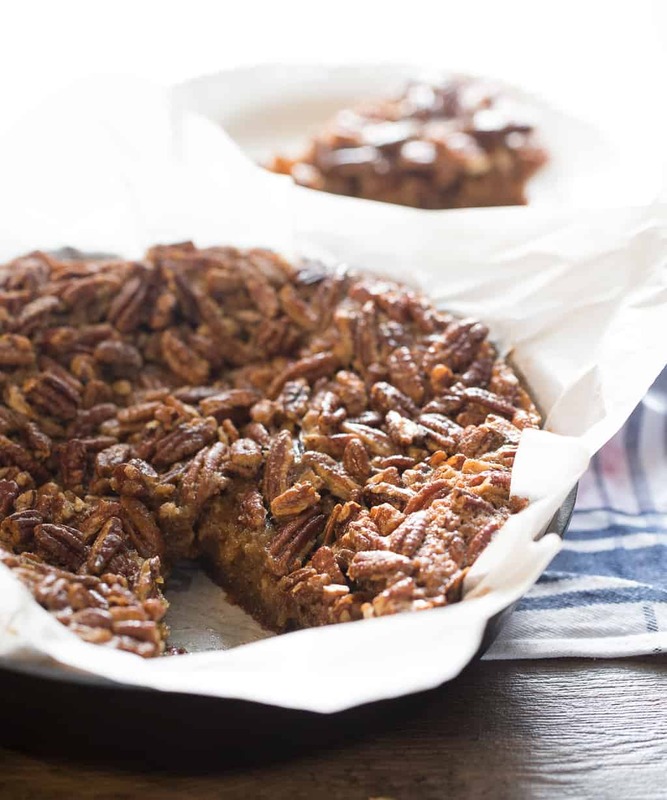 Instead, the pecan layer sunk down into the blondies, creating a sort of bread pudding type effect, but with a little more heft to it. So I cut a piece, and took a bite. Somehow this hot mess express turned into something that is better than any traditional pecan pie I’ve ever had or made. TBH You should also just make this blondie crust sometime and enjoy it as is. 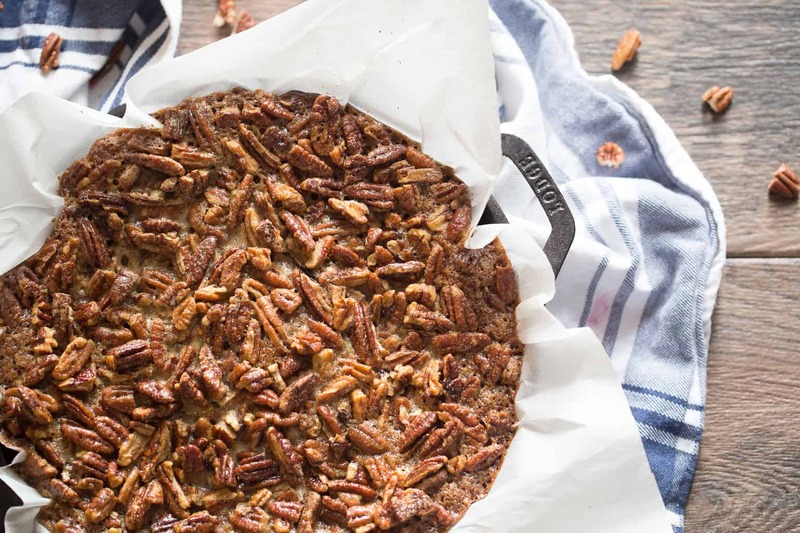 For one thing, this pecan pie made without corn syrup uses maple syrup to bind and sweeten instead. Then, the blondie layer gives something for all that deliciousness to soak into. Did I mention the bourbon yet??? There’s bourbon in all of it. Layers and layers of bourbon. 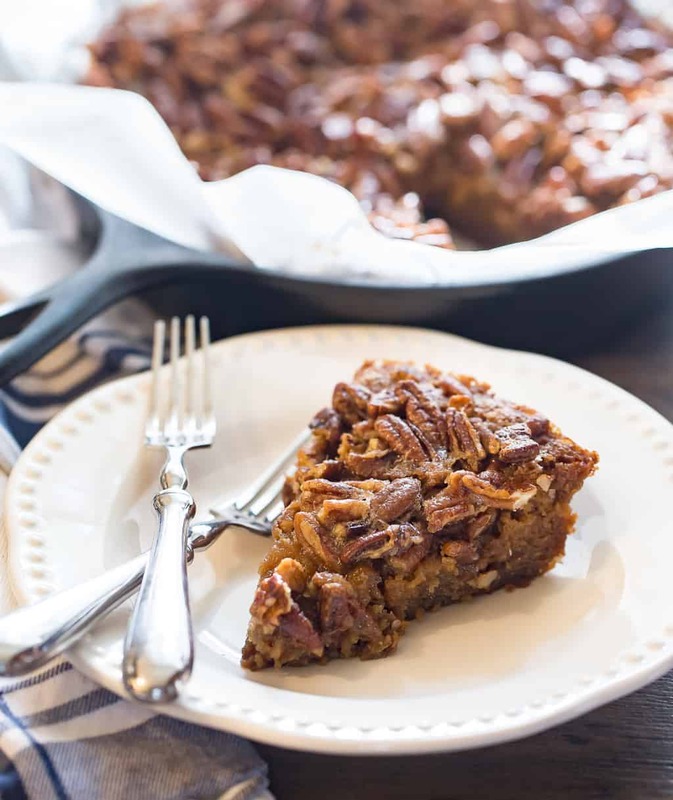 The bourbon gives a bite that cuts through all the sweetness and gives this pecan pie blondie thing some soul. 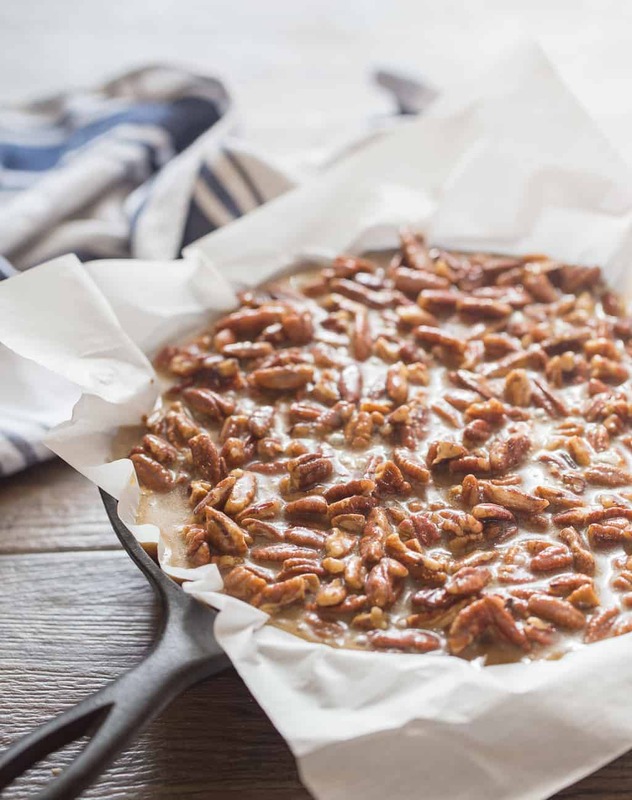 I am not kidding – I will never make another pecan pie again. This is all I want from now on. 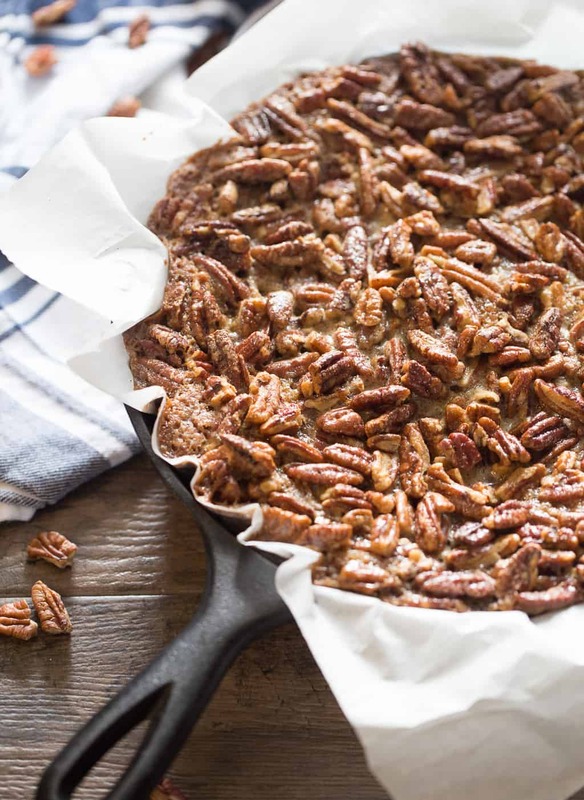 Better than the classic, this bourbon pecan pie with blondie crust is made without corn syrup. 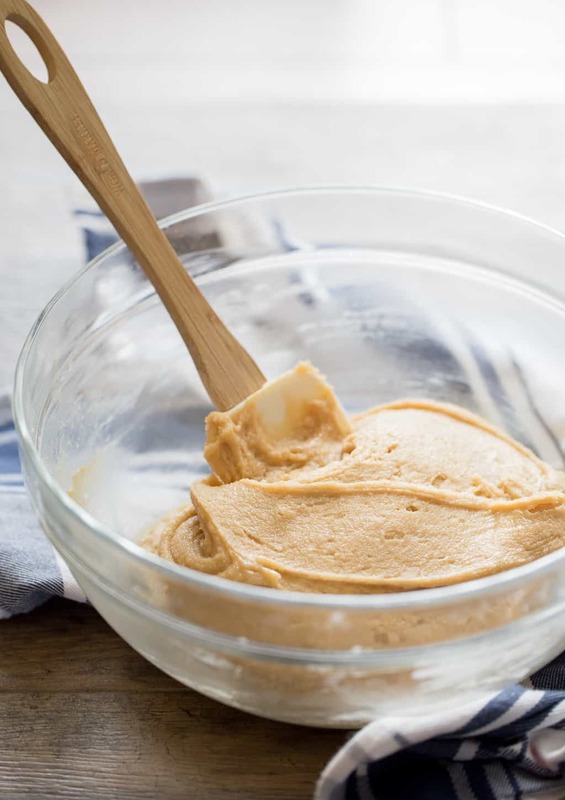 It's a delightful spin on a Thanksgiving and Christmas favorite in the South. 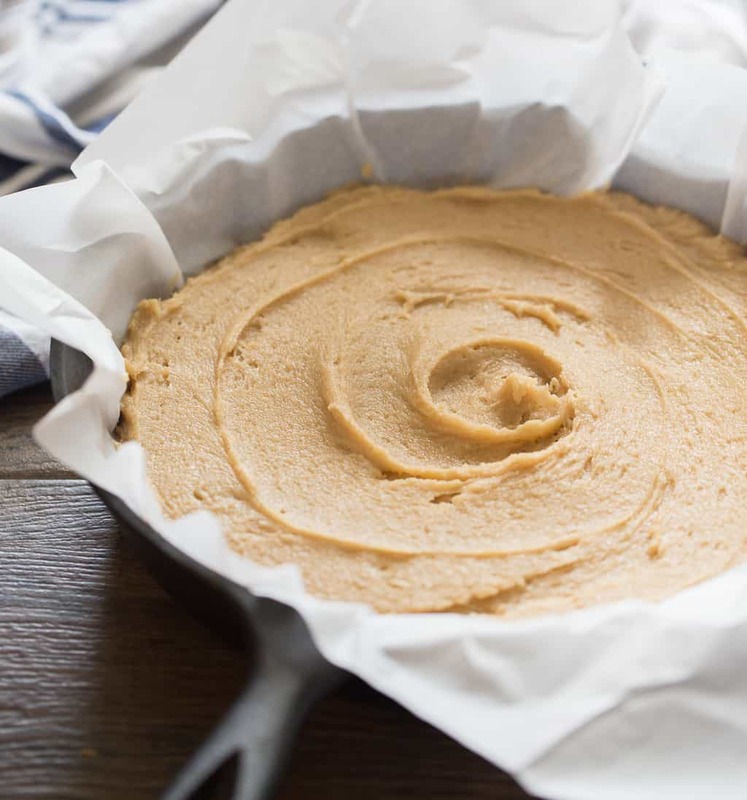 Preheat the oven to 350 degrees F. Tear a sheet of parchment paper and place it in a 9" cast iron skillet that is fairly deep. My standard Lodge 9" skillet was perfect. 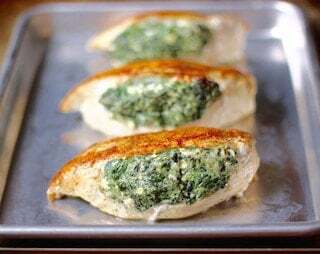 No need to do anything fancier with the paper than place it in the skillet and fold a few edges into it so that it roughly sits in the pan with its corners hanging over the edges. Make the blondies first: Stir together the melted butter and sugar. Stir in the vanilla and eggs. Once they are all combined, stir in the flour, salt, and baking soda. Baked at 350 for 25 minutes. While the blondie crust is baking, prepare the pecan pie filling: Combine the maple syrup and melted butter in a large bowl. Stir in the sugar, bourbon, vanilla, and salt. Stir in the eggs until they are well combined. 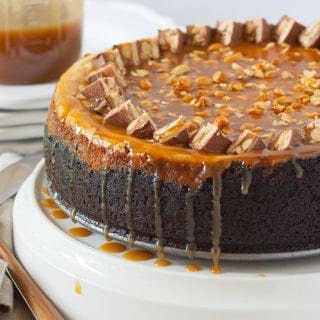 Stir in the pecan pieces. When the blondes come out of the oven, let them rest for about 10 minutes, then pour the pecan pie filling on top and place the skillet back in the oven for 30 minutes.